Sarah is a partner at McCrate, DeLaet & Company. She started as a staff member of the firm in 2006 and has continued with a passion to help her clients. She is responsible for preparing and reviewing returns and financial statements, directing the firm's tax preparation process. 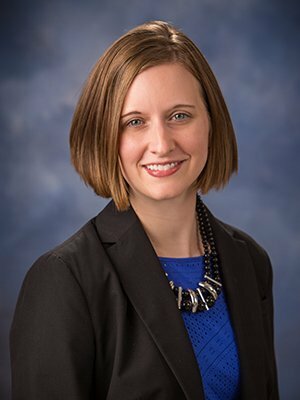 Sarah is a member of the American Institute of CPAs and the Ohio Society of CPAs, focusing on their tax and small business sections. Sarah is also a financial advisor and has passed the FINRA Series 7 and 66 exams. Sarah participates in Women in Leadership of West Central Ohio and is a member of the Sidney Rotary Club. She is the co-chair for Ft. Recovery Combined Charity. Sarah specializes in the agriculture industry and taxation for individuals, partnerships, corporations, gifting, and QuickBooks. She earned a master’s in accounting with a taxation specialization and a bachelor’s in business administration with a specialization in accounting, both from Bowling Green State University. She enjoys spending time with her family, walking and reading. She lives on a farm near Fort Recovery with her husband, Tim, and they have three children—Charlie, Kaitlyn and Kent.